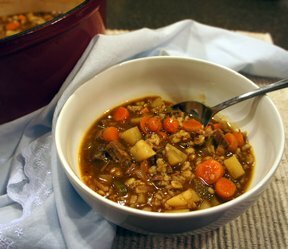 Great stew that is full of flavor. Don't forget the rutabaga - it adds loads of taste. 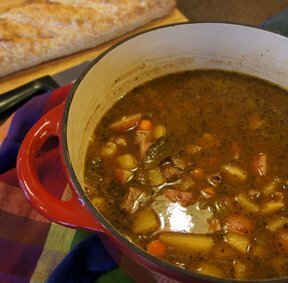 In a Dutch oven over medium-high heat, brown meat and onion in oil. Add onion, water, bouillon, bay leaves, basil, pepper and vegetables; bring to a boil. 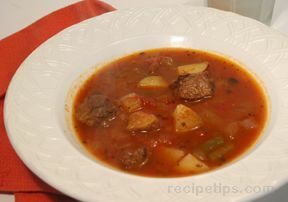 Reduce heat; cover and simmer for 1 1/2 hours or until the meat and vegetables are tender. Combine cornstarch and cold water until smooth. Stir into stew; bring to a boil. Cook and stir for 2 minutes or until thickened and bubbly. "Yum! Full of flavor is right! Made this yesterday and had it simmer all afternoon. Served it over baking powder biscuits. Great Sunday supper."